I'm taking off tonight for another round of travels. This time, I'm flying to the east coast to attend the little bro's college graduation. I can't believe he's days away from becoming a working professional! In my mind, he'll always be my thumb sucking brother who collects Pokemon cards and watches The Lion King every single day. How did the munchkin grow up so quickly? Over the years, I've stood by his side as a proud sister as I watched him accomplish so many great things. He's an Eagle Scout, a rubik's cube master, and the king of beer pong. And come this Sunday, I'll get to witness my baby brother take his first steps into the real world. He's going to kill it. But if he stumbles, I'll be there to lift him right up. This weekend, I'll be in and out of planes and airports which got me thinking about landing strips and the Schick® Quattro for Women® TrimStyle® (how's that for transition!). In celebration of the launch of their Prune for June Summer Style Contest, Schick created five pinterest boards each inspired by a gal's favorite trimming style. What a cheeky way to approach a hairy topic! My favorite board is The Landing Strip as I'm all about clean lines for summer. Inspired by the board, here's a head to toe linear outfit that's ready to come in for a smooth landing. Schick® Quattro for Women® TrimStyle® enables women to shave, trim and transform themselves with a simple flip of the handle. Getting your garden ready has never been this much fun thanks to the Prune for June Pinterest contest. Share your best summer style for a chance to win amazing prizes. Your outfit is cute! Love it! You look amazing. Have a nice day. You have such a nice blog too! I'm following you on GFC from now! thanks for stopping by! love the jacket! 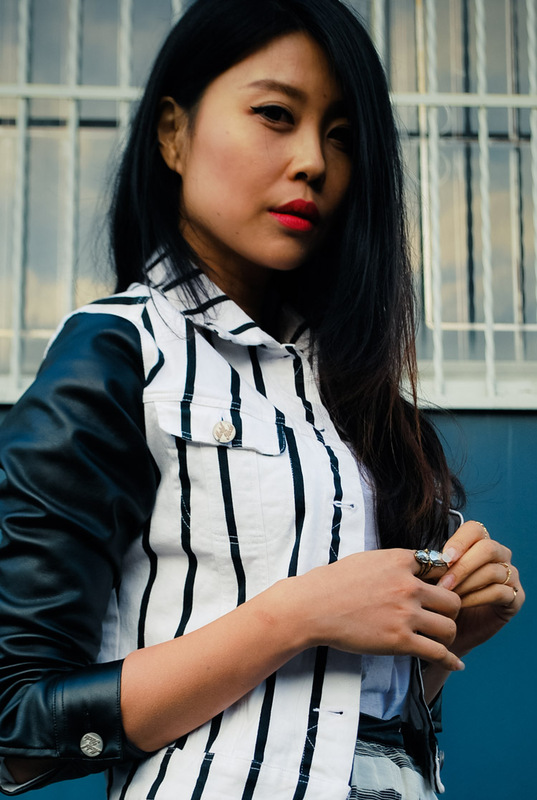 so cool with the stripes and leather!! Gorgeous! I love the shorts! I love the jacket and the shorts, great outfit ensemble! Love that jacket and those shorts!! totally love this black and white outfit much! This jacket is so beautiful and stylish and your sandals are gorgeous! Ah, how lovely that your brother is graduating! The way you've described him sounds so much like my little sister (Lion King, beer pong, all of it ;)), who is getting married this weekend. Crazy how fast they grow up! looking great in black and white !! Gorgeous...as always! Love the mixed prints. Great Outfit ,you look amazing! Love the Pictures! Hope you have a great visiting your lil brother. congrats to your brother, i just watched my little brother graduate highschool!! i love this jacket, it is stunning! Aww, I hope you have fun at your brothers graduation! Good luck to him. Those heels are divine on you! Ahh it is sad/interesting to see our siblings age right? Congratulations on his graduation! Thanks for stoping by and have a lovely weekend! Love the mix of prints and textures in this outfit :) And how great are the yellow stripes down the shorts?? Very cute look. I need those heels in my life. too cute! Day sale includes deep discounts on just about everything else you can imagine. you and anybody else at any age and irrespective of your skin type. thanks for visiting my blog! love your jacket and shorts! Looking totally fab again :-) Love the shoes! Lovely outfit. Looks great on you. Those heels are gorgeous! wooow I love this jacket! I love the jacket you are sporting!! He's a rubik's cube master?? He's a hero in my book, I'm not patient enough. Or smart enough. :D Those shorts are really cool, babe, and I WANT that jacket of yours!! Wowzers! Must have those heels!! Love the whole glam look!! Love those shorts, and your blog. Would you like to follow each other on bloglovin? Love these sandals and the short!! BTW, congrats on ur brother's graduation! Hope you are having a wonderful day! biz member, Ed Bankos' personal invitation, I invite you to check out the site. If you carefully read all of the directions on the package, you can freeze off your skin tags without feeling any pain and they'll be quickly eliminated. starts to appear and proliferate as the years pass. your skin. This method typically involves some pain or discomfort. Love Love Love your shoes! I wish shoedazzle shipped to the UK! Love this look! Those heels are fabulous and the shorts are so cool!